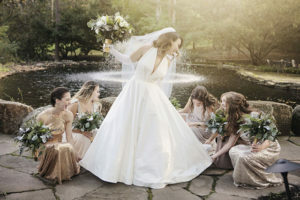 One of our beautiful bride’s was featured in The Philadelphia Inquirer’s wedding story section. “Meet your neighbor, Alexa,” said Will’s mom, Sue. Kim and Keith Miller and Sue and Rick Schaub had lived next door to each other for more than half a decade. But Alexa lived in Pittsburgh and worked at the Allegheny County Housing Authority, and Will had joined the Air Force before his parents moved from Medfield, Mass., to Washington Crossing and was stationed in Rapid City, S.D. Thanksgiving 2016 was their first simultaneous visit home.